We take great pride in doing the job right the first time. Our goal is complete customer satisfaction from assessment, installation and service. At Ohio Generator Experts serving Northern Ohio, we know there are a lot of options out there when looking for a home standby generator. Read reviews from our customers and then contact us today! Reviews from our customers are important in deciding who to hire. We strive to provide the best quality commercial and residential generators, as well as the best customer service. Our professionals are highly experienced in bringing you the best experience possible when providing the best home and commercial generator assessment, installation, and service for generators. Don’t Take Our Word for It… Read What Our Customers Have to Say! "Too often owners only hear complaints or negatives about the services your employees provide, I’m here to tell you the opposite. Your employees were awesome. They arrived as scheduled, worked efficiently to install my Generac generator, acted in a very polite and courteous manor, and completed my work without a hitch. When entering my house they covered their shoes and made sure the area they worked in was impeccably clean, tested every possible outcome, and in general acted very professional indeed. That kind of professionalism is seldom seen today in the service industry. My compliments to you as the owner, for I feel that always comes from the top. In short I will not hesitate to use you guys again and feel very comfortable recommending you to my friends and family. Looking forward to a long service relationship with Portman Electric! ---- Matt"
"I want to thank Jeff Portman and the entire crew (Dave, Joe & Tim) at Portman Electric for the wonderful job they did in installing my whole house generator. They were all very professional, friendly, and courteous. They were able to help me pick the correct generator for my situation. They installed underground wiring from the street to the house and to the generator. Also included was a new breaker panel in the home. They even leveled out the ground after removing the soil for the power line. This was very extensive job and they did a wonderful job. Bottom line: (A) I would definitely recommend them to anyone interested in installing a whole house generator. I could not ask for anything more, and the price was not the highest and not the lowest of the three quotes I received, but in the middle. It was worth every penny I paid and I am totally satisfied with their workmanship. (B) The second thing, besides price, that I look for when evaluating quotes for service is "Character". Jeff Portman is a man of "High Character" and the type of person I would do business with on a hand shake only. Portman Electric will be my service providers from now on. Five Stars. Thank you Portman Electric. Former Senior Procurement Agent for Goodrich Aerospace (Retired)." "I would like to take this opportunity to acknowledge the excellent work your two employees did while installing a generator at my home. These two gentlemen were efficient, knowledgeable, neat and friendly explaining the installation project as it went along. They worked diligently through the entire day never taking time for lunch to complete the project that day so they didn't have to return the following day to finish. We have used your company for the past several years and have been very pleased with the service that you have provided. Again I cannot say enough on the great job your two employees did on Monday. I can assure that we will continue to recommend your company to our friends and family." "Adam and Mike installed a Generac Generator for me in Burton on April 17th. They Friendly, Efficient and Professional." "From the initial contact for an estimate on a Generac generator through the conclusion of the project, I felt very comfortable and confident with my decision to have Portman Electric install the Generac generator. Everyone was friendly and professional. I felt completely informed on the installation and operation of the generator. I am extremely satisfied with the professionals of Portman Electric. Thank You!" "I used Portman Electric to upgrade my Generac Generator to a larger unit to power the entire house. I received quotes from multiple dealers, and Portman was the least expensive. They were prompt, professional, and ALWAYS answered ALL my questions. Dustin, who works for the company, took his time to make sure everything was just perfect in every way. He was friendly, and knew everything there was to know about the unit. To say they were excellent would actually be an understatement! I highly recommend them to everyone, and I will use the company for all my generator services including the yearly inspections.In addition, any other electrical needs I may need, will be handled through Dustin at Portman Electric.They are the very best! JL"
"Wonderful! We could not be more pleased with our generator. It was installed in 2011 and is still working perfectly. Portman has also done several small electrical jobs for us. They are a professional company with great customer service." "Adam and Dennis, the professional installers of our generator were fabulous with whom to work. They were detailed, polite, professional, down-to-earth and shared a good sense of humor. Two thumbs up for how we were treated by Portman Electric and the three employees, (including Dustin, the one who assessed and then quoted our installation) with whom we interacted. In addition, a follow up call to the office was answered by Diana, who again was friendly, efficient and detailed." "From the day I first received a quote, to the installation team, everyone I dealt with was professional and committed to doing the job right. They also were approachable and able to answer all of my questions. First class operation here." "Every single person with whom I dealt at this company was friendly, knowledgeable, and an outstanding professional. This type of customer service is very rare indeed these days. We made a major, and expensive, purchase, and I was at first nervous. Portman Electric turned that feeling around with its superb service." "We contacted a few Generac Dealers in the area and received quotes from all of them. Portman was the most knowledgable and professional. They weren't the lowest initial cost however, they were offering an Angie's List coupon which lowered they're price to the same or better than the other dealers. Glad we decided to go with Portman!" "It was a pleasure working with Dustin, he explained everything to the detail and on working with me to get the best price I was looking for. The installation crew of Adam, John, and Dennis worked very well together. They arrived on time and explained how and and where the unit was to be installed. They informed me when and how long the power would be turned off and completely cleaned up after their work. Adam also informed me that he discovered a hazard inside my existing meter base that could possibly burn down my house." 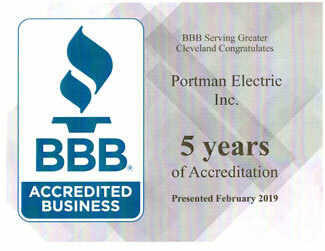 "Portman Electric was professional from estimate to installation. The installation of our generator was quick, efficient & perfect. I would highly recommend Portman Electric." "Dustin helped us choose the stand-by generator solution that best met our needs. The installation crew was punctual and hardworking. They worked hard despite our house and yard's obstacles. Everything (including some other electrical work) was completed within the day. We are pleased with their work and service." "We had intended to get at least two estimates; however, after Dustin left our home, my husband was totally sold. Dustin is a real asset to Portman. Neat, smart, and willing to put in as much time as necessary to answer all our questions. The weather was still not ideal (February) and we were able to agree to do the install in March. Our house was built in 1930 and so it needed a new electric drop and a gas meter upgrade to meet the needs of the generator. All that was discussed agreed to up front so there was no delay. The only glitch came from the city permit clerk. The price of small town living." "Dustin came out to give us a quote on the project during the summer. He was right on time for this appointment, and was very thorough in both his presentation and answering all the questions I had about the project. Within a day, I had the quotes for the two potential Generac units we could have used for the project. We then scheduled the project (full day) for a mutually agreeable time. The installation crew (2 electricians and 1 plumber for the gas line) were on-site right on time and reviewed the game plan for the installation with me. From there, they got right to work, being very careful to lay protective coverings on the flooring in the house. The project was done as agreed, and then they gave me a run through of how the unit worked, maintenance, etc. A couple of weeks later, they came back and met with the city inspector to finalize the required inspection of the unit and related installation. I would definitely recommend Portman Electric for the installation of a generator, and would also consider using them for other electric projects around the house. Nice work by the Portman team!" "Portman provided excellent service from initial point of contact through installation. On initial contact we received a return call from Dustin Pettry who scheduled a convenient evening call to assess our needs and provide a quote. I originally saw him on a local TV station covering the benefits of a standby generator and was impressed by his presentation. In researching Angie's List they are A rated and all reviews on generator instatllations were very positive. He provided my request for references in my area which were very positive. I also checked with our City who reported a number of installations in the city and no reported issues. Based on our needs we selected the 17kw whole house generator. A convenient date was scheduled and the unit was installed. The installation crew was excellent. They were efficient and cleaned up after the installation. The required city inspection was conveniently scheduled within the week. The owner Jeff Portman was on-site for the inspection and took the time to answer any additional questions I had. We had a summer storm shortly after installation which knocked power out so the unit was quickly tested and performed as advertised. Recently their office initiated a call to schedule my annual maintenance check. Very impressed by their overall quality of service. The price included taxes, permit and a 5 year extended warrantly offered through Angie's List." "After much online searching I asked for an in-house survey by Kohler and Generac generators from local providers. Dustin from Portman won my business. He quickly assessed what size generator was required for a whole house solution. By putting the air-conditioner on a lower priority (the system would shut it down if demand went too high), I got by with a smaller unit. This, also, allowed me to have all the electrical switching done at the meter and not at my inside panel. The contract was signed and an install date selected. As is normal with me I had a few more questions. Dustin quickly answered them all by phone or email. The installation day arrived along with brutally cold weather conditions (5-10 F). They showed up around 9 AM and worked without a break till the job was done around 3 PM. The installation crew (Adam, John and Dennis) were knowledgeable, friendly and took extra precaution to prevent damage to my home." "Called Portman and requested information about a standby generator - at the time we hadn't decided for certain if we would purchase but wanted to see our options. Dustin came out several days later to assess our electrical needs, explained options and provided an estimate several days later. Dustin was very helpful and answered all of our questions very thoroughly. Once we decided to move forward, Dustin provided me with sizing to contact the gas company in prep for the installation. A new gas meter and service line were required to support the generator. Was contacted by Portman about 4 weeks later to schedule an installation date. The installation went very smoothly - Adam and Dennis did an excellent job and were very neat and tidy with their work. Everything was cleaned up to my satisfaction and, upon completion of the work, Adam walked me through the generator and components and explained things very thoroughly. City inspection of generator yielded no issues. Very satisfied with the job and would definitely use Portman Electric in the future." "Electrical power occasionally goes out in this area. In October 2012, when Hurricane Sandy came through northern Ohio, the power was off for a week. After dealing with the reconstruction caused by the storm I wanted to get a backup generator. I contracted three companies I found on Angie's list. There were several reasons I chose Portman Electric - It was obvious that Portman Electric installs many backup generators, in comparison to other companies who occasionally install a generator. Doing this on a regular basis gave me confidence the job would be done correctly - Portman services the generator they install. Other companies refer service to a third party - A backup generator requires connections to the electric and (in this case) gas supply. Portman was the only company who would take care of the entire jobs. Other companies would take care of part of the job - either electric or plumbing - and I had to coordinate with a contractor who took care of the other part of the job. I scheduled the installation date two months in advance. I received a call two weeks prior to the installation, and the morning of the installation, to confirm the appointment. I was advised the power to the house would be off for an hour or two (both during the initial estimate process and on the appointment confirmation calls). It was suggested the heat be turned up earlier in the day to make up for the period of lack of power. The area where the generator was being installed had about a foot of snow. The crew removed the snow and cleared the area. The gas line had to be buried, and a trench was dug for the gas line in an area where the ground was frozen. The installation is very neat. It's obvious that providing installation quality is important to his company. The entire installation took about four hours. Dustin Petrey, the person who did the initial estimate and one of the installers, showed me the important areas of the generator, gave me information about its weekly test and answered all other questions I had. The Portman Electric crew did an excellent job and I highly recommend them." "I can not say enough about the professionalism shown by all of the staff I dealt with was simply outstanding. All the people I had an interaction with from Dustin, the scheduler, and most of all the installation team are outstanding. The day of the installation arrived and so did the installers, very punctual. They provided an estimate of how long the installation would take and went right to work. Before they turned off the power they informed me so I would be able to shut down our computers. Overall I was very impressed with the installation. They cleaned up all the areas they worked in both inside and outside. I will use them in the future for any electrical work I need done. As a retired regional service manager I can really appreciate the outstanding and professional team Portman Electric has working for them." "We met with Dustin in August, 2013. He was very knowledgeable and gave a full explanation of their product and what to expect with the installation. He checked all locations that would be necessary for the installation. These included the electrical box, the generator unit, and the gas line. He showed pictures so we fully understood what to expect with each step. He promised all permits, inspections, and specialty work such as gas line hookup would be handled by licensed professionals. Additionally he assured us that all work would be completed in one day. They did exactly what they promised. Every person on their crew was polite, pleasant and respectful. All seemed quite skilled at their task. We also are very pleased with the neatness and appearance of the unit and the new electrical box. It seems they use quality materials. We also like the self checking function that is built into our generator. We already has an occasion to experience what it was like to lose power and have the generator kick in. Great to know we have that protection." "Called for an estimate...Dustin came out and was very informative and professional. They may not have been the least expensive but in my experience sometimes you get what you pay for, and with this upgrade to our home we wanted to make sure we chose wisely. And it seems we did! Very happy with the install and cleanup! I would definitely recommend them to family and friends." "After losing my electric service for over three days in 2012, I decided to have a backup generator installed. I selected Portman Electric because of their references on Angie's List. This was also the time to have my 59 year old electric service boxes updated. The location for the generator and the paths for the gas and electric lines were established by Mike and I and the gas line sub-contractor at the time of the initial review and prior to receiving the proposal from Dustin. From the proposal I selected the larger generator so the whole house would be covered with my careful use of the circuits. Dustin and Adam arrived on time on the selected day and began work right away. Adam took charge of the electric panel installation. I had several electric boxes in an ugly configuration, but Adam was able to consolidate them into one neat modern circuit breaker panel. His work was meticulous and orderly. I understand the before and after pictures of the fuse panel have already been used by Portman as a selling point. Dustin proceeded with placing the generator at the desired location and establishing the path for the electric conduit and gas line. The lines were neatly placed in position as initially determined. Dustin connected the generator to the many wires in the conduit between the generator and the transfer switch which is mounted next to the new circuit breaker panel. He also connected the remote monitor which is mounted in the house so I can check on the condition of the generator. The sub-contractor, selected by Portman, for the gas line arrived on time and proceeded to intall the additional gas line. This sub-contractor worked closely with Dustin and Adam providing another set of hands as needed. The house was without gas or electricity for the entire day but they completed the entire job in one day. The entire job was done very neatly and professionaly. I am very pleased." "For years we had wanted a generator. We were tired of roughing it every time the power went out. One day we were following a van with a Generac logo on it so we called the number on the van and the guy came out to give us an estimate. He really was of little help. He wasn't sure what size generator we would need or when he might be able to do it, he'd get back to us with a price and more information. Well we never heard from him again. That's when I decided that I should probably call Portman Electric, after all the Angies List coupon had been hanging on the fridge for months!!! We scheduled an appointment with the secretary and a couple days later Dustin was at our door step. He was EXTREMELY knowledgeable. He had pictures from previous jobs, explained the difference between the generators and the installation process. He left us with 3 options to choose from. No pressure. We called him with our decision and 4 weeks later Dustin and Adam were back for the installation! They arrived on time and were all business. They let us know when they needed to turn off the power, relit all pilot lights, went over the unit with us and they left our house cleaner than when they started! They were very polite and respectful. We can't say enough. We are VERY happy." "Dustin did an excellent job of determining the size and type of generator we needed, the proper placement and the necessary gas and electrical connections. Once we agreed on the contract, the installation was scheduled promptly and was done smoothly. Dustin himself was here for the job and made sure everything was working correctly. Couldn't ask for better." "The estimate for the generator was prompt. Dustin our salesman was very knowledgable and helped in our decesion making process. The installers were prompt and explained the installation process to me. They cleaned up after the generator was installed and working properly." "Had a very good experience with Portman Electric on the installation of our whole house generator. Staff were very pleasant and easy to work with. All the staff I worked with were very knowledgeable. Already referred Portman Electric to three other families who were quite interested in getting a unit for their home." "From initial contact and review of our needs the purchase and installation Portman was excellent. The crew was friendly, knew their business, and paid attention to controlling any mess and clean up after the job." "Very good experience, they were in and out in less than five hours even after going over the operation of the generator and cleaning everything up. Friendly, knowledgeable, and a very professional installation. Great job!" "Dustin provided a detailed quote and reasonable price. The installation was on time. I observed the installation, which was done very well with good clean-up." "Over the last few years we had discussed getting a backup generator, especially after power outages lasting for hours. The outage earlier in 2013 during relentless driving rain lasted 23 hours and was followed by three inches of water in our basement. Using a portable generator (and staying up all night to keep it fueled) we drove our sump pump to exhaustion and the battery back-up pump failed as well. Initially we leaned toward a smaller selected-circuit backup system. After seeing Portman trucks in our general area and reading favorable reviews on Angie's List we called the company and made an appointment for a site assessment. Dustin Pettrey came out, looked at our situation outdoors and indoors, and within a matter of days came back with a choice of proposals in an email. Since the cost differential between a selected-circuit system and a whole-house backup system was not all that much, we decided on the latter and contracted to have the work done. Mr. Pettrey and his colleague came out and placed the generator on the optional poured-concrete pad we selected in a perennial bed I had cleared of its plants. The connection to the natural gas line was neatly and sturdily made with multiple support struts. The indoor electrical connections required making changes to the two electrical boxes. Mr. Pettrey gave us complete paperwork on the system and informed us of the maintenance and upkeep required. All work was accomplished tidily with no scrap, dust or metal shavings left behind. We also appreciated receiving the extended warranty benefit because of the Angie's List connection. The professionalism we enjoyed at every step of the process from our first phone call of inquiry was reassuring and inspired confidence that we were doing the right thing." "From the start this was an exceptional experience. I located this company on Angie's List. They promptly contacted me and made an appointment to inspect my home. They provided several written options for my consideration. They also pointed out a minor problem with my meter box which they would also fix. After speaking with other contractors and exchanging several email and phone inquiries with Dustin at Portman Electric I decided to go with them. Within a week of signing the contract a date was set and installation completed. They arrived timely and completed the installation in a few hours. They tested the unit and reviewed the system operation with me. They cleaned up after completing the job leaving everything in good condition. I am sure I will hire them again for my electrical needs. What I felt most comfortable about was they are licensed electricians, were an authorized dealer and they provide the service and maintenace for the generator. I highly recommend them." "On the day of the installation, Dustin and Jason arrived in the morning as scheduled..They inspected the work site and discussed with me the best plan of action, then they got to work. The job took about 6 hours of continuous work. They ran gas and electric lines to my existing utilities and installed a box for the generator next to my existing electic panel. They even straightened out and reset some of my existing breakers to a neater pattern. The work they did in the basesment and outside was so neatly and profesionally done that you could not even tell that they did any work there. The generator outside was placed on a limestone base with treated lumber along the outside edges, none of my shrubs were disturbed. They cleaned up after the work was done, I could not even tell they had been there and it was one of the muddiest days of the season." "Our experience with Dustin Pettrey was good. He was on time and was professional. We spent around $200. We would use him again in the future." "Choosing and installing a generator from Portman Electric was made as easy as can be by Dustin Pettrey. He was truly a pleasure to work with from beginning to end." "My wife said "no more" when the power went out for 3 days and we saw they had power just across the street. I had no trouble with getting through and setting up an appointment. Dustin came out, said it would be no problem with the setup and we went over the options. I really do not remember too much delay, but there was some slowed shipping from hurricane Sandy, but it was a small delay. Whenever I called for an update, Dustin or the young women at Portman would call me back within a day or even pick up the phone, but they are always busy. Dustin came out with 2 other installers and within a few hours we had a whole house 17kw gererator in place and it looked and worked great. I had already moved plants from the area for the generator and they came in and used stones and wood to level it out and make it look like a great addition to my back yard. Dustin came in after all the installation was done and took my wife and me through what they did and what we had to do which turned out to be nothing. We have not had a power failure since then, but we hear the gerator test itself every Saturday. This was a great experience, expensive, but great. If you shop around for other brands of gerators, you will find them more expensive. It took us a couple of years to save up for this one, but the safety is worth it. The other thing that I think Dustin did well was setting up and being around for the city inspector to come to the house, one more thing I did not have to worry about. Thanks Dustin and everyone at Portman. I will be calling you about some electrical additions to my basement when I can." "Dustin provided us with recommendations and a cost estimate for two alternatives after a detailed discussion of our needs and of the capabilities of different units. The actual installation was understandably delayed a bit by the work that the gas company had to do and because Dustin attended the special training course to take care of our special requirements. On the day of the installation, they arrived promptly. The installation of the generator, new wiring, rewiring, and new gas plumbing was carried out neatly and everything was cleaned up following the installation. All work was finished by 4 p.m."
"Everything went very well. Dustin was very responsive before, during, and after the installation. now all we have to wait for is a power failure which we hope doesn't come." "Dustin Pettrey and his team did an excellent job from an initial evaluation to the very end. The job was performed during one day, very efficiently and cleanly. They even replaced an old grounding pipe, which wasn't in a good shape, and insulated the grid wires coming to the house. I was very pleased with this project." "Dustin came out quickly (there was an opening in his schedule) and gave us an estimate within an hour. He answered all the questions we had at that time and followed up on email with other questions throughout the process. Once we committed and we set up a time, he arrived promptly and completed all the work. He took into consideration our request to install the unit a little above ground level and installed the transfer switch inside the garage after we expressed concern about it being outside. He also replaced our aging electrical panel and even handled a few odd electrical jobs we had asked for. The site was clean and neat before they left and they explained how everything worked. (They even painted the piping to match our gray siding.)" "This company has been outstanding from the time of quote through installation. The people in the office are wonderful and Dustin the installer is outstanding. I had other contractors submit quotes and there is no comparison to how Portman handled the entire process. Always did what they said they were going to; they showed up on time, follow-up over and above what I expected. I would recommend this dealer for any type of service they offer. Truly outstanding service!" WE WERE VERY HAPPY THROUGH THE WHOLE PROCESS. We called Portman Electric to inquire about a whole house generator. Dustin came to our house and provided us with several options. He was very knowledgeable and was very honest as to what our home needed. We decided to go with a smaller unit as we were not going to put our A/C on it. The workers came to our house as scheduled and installed the generator in less than a full day. They explained what they did and went over the operation of the generator. We were extremely pleased with how everything turned out and would highly recommend Portman Electric." "Job was done within time limits and within our schedule requirements. Personable installers on job site." "I had called another electrical contractor who advertised in a local paper, but after 3 phone calls, they never responded to even offer a quote. Generac recommended Portman Electric. I did a BBB search and read reviews by other customers before I called Portman. Dustin scheduled an appointment for Saturday morning. He reviewed our house, the appliances, the furnace and A/C, and the electric and gas. Dustin was very thorough, professional, and courteous. I had researched Generacs and talked to other people who owned them. Dustin explained everything in detail and made sure I understood everything.He emailed my quote that next Monday and suggested a 10 Kw unit that would easily handle our A/C unit load. I paid a deposit to place the order, knowing that it would be 6-8 weeks before the unit would be available. I guess so many people were placing orders, the company in WI was severely backlogged. They hired 400 employees to increase production.Dustin called me in late February to set an appointment for March 7. He and another installer arrived that morning and immediately began prepping the gas and electric hook-ups and the site for the placement of the generator unit. They kept me informed about what they were doing and asked me when it would be okay to shut the power and gas lines off to make the connections. My wife is disabled and Dustin was worried that they would adveI left to go to work and they completed the installation. Dustin called me to let me know all was done. It took about 4 hours. When I came home, the generator was in place, the gas and electrical connections were neatly done and looked great, the area was cleaned of all debris, as if they had never been there.Dustin came back that evening to go over the operation of the generator, the transfer switch, the controls, and ran it through a shutdown and transfer cycle so I could watch it operate.The unit automatically cycles on once each week for 10 minutes at a preset day and time. It is as loud as a standard lawnmower and the noise of the generator is not noticeable from inside the house. "; $test[$inc][blurb] = "I had called another electrical contractor who advertised in a local paper, but after 3 phone calls, they never responded to even offer a quote. Generac recommended Portman Electric. I did a BBB search and read reviews by other customers before I called Portman. Dustin scheduled an appointment for Saturday morning. He reviewed our house, the appliances, the furnace and A/C, and the electric and gas. Dustin was very thorough, professional, and courteous. I had researched Generacs and talked to other people who owned them. Dustin explained everything in detail and made sure I understood everything." "We have been very pleased with Portman Electric. They are professional, knowledgeable & dependable." "From first contact to installation they were prompt, efficient and professional. The installation crew was friendly,on time and informative about the process. They got right to work, did a very neat job and cleaned up afterwards. Great Job!" "Arrived right on time, worked straight through until the job was done, reviewed the project with me; I'm delighted." OUR EXPERIENCE WITH THIS DEALER HAS BEEN EXCELLENT. "We located Portmann via the Generac web site, and also found excellent reviews and ratings on Angie's list. Dustin Pettrey visited us the day we called! He provided excellent information about our choices, and how a generator might be installed at our house. He was very patient while we got estimates from another company. Diane Lenz in the Portmann Office was also helpful. We chose an 11/10 Kw (10 Kw using natural gas); quoted costs included a transfer switch, load-shedding capability, and a cold-weather package for providing heat to battery & oil. Adam and Dennis did an excellent job of installation, checking gas appliances after power had been off, testing the generator, and explaining things to us. Our main incentive for generator installation was because previous power failures inactiviated our sump pump and led to our basement flooding. The generator was installed 3/22/2016 and includes a 5 extended limited warranty--assuming we have annual maintenance done each year, and Portmann does the maintenance (battery check, oil-change, etc.)" "The installers arrived on time. They keep us informed at each step in the process, like where the generator and switch would be located, when the power would be out, etc.. At the end they cleaned everything to where we had to do nothing extra. Extremely satisfied." "My wife and I were very pleased with Jeff during the purchase process. John was very helpful with getting us information to get approval form our condo association. Adam and John did a great job on the installation. Overall ever aspect of getting a generator was seemless. Thanks, Portman Electric!" "I would highly recommend Portman Electric to anyone interested in a backup generator. Adam and Dennis were very informative and courteous and right on time. Everyone whom I've had conversation with at Portman have been very professional. I will keep Portman Electric at the top of my list for all my electrical work needed in the future. thanks again"
"Dustin and his crew showed up on time and installed my new generator as promised. They were friendly, helpful, and very professional. The worksite was completely cleaned before they left and they hauled away any miscellaneous trash. I would unhesitatingly recommend them to anyone interested in a generator or any other electrical work!" PROFESSIONAL, COURTEOUS, PRICE WAS LESS THAN AREA DEALERS. "I was very pleased with the service and care I received from Portman Electric. This dealer was recommended to me and I would highly recommend their service to others. The estimate I received for the 10/11kw Generac generator install was less than area competitors, and the entire process was very pleasant. The staff was positive and accommodating as I set up the install appointment. Adam, the technician, was very professional and pleasant as he installed the Generac in freezing cold temperatures. Before he left, he took time to explain the generator and other services. This is a dealer that I highly recommend!" "After much online searching I asked for an in-house survey by Generac generators from local providers. Dustin from Portman won my business. He quickly assessed what size generator was required for a whole house solution. By putting the air-conditioner on a lower priority (the system would shut it down if demand went too high), I got by with a smaller unit. This, also, allowed me to have all the electrical switching done at the meter and not at my inside panel. The contract was signed and an install date selected. As is normal with me I had a few more questions. Dustin quickly answered them all by phone or email. The installation day arrived along with brutally cold weather conditions (5-10 F). They showed up around 9 AM and worked without a break till the job was done around 3 PM. The installation crew (Adam, John and Dennis) were knowledgeable, friendly and took extra precaution to prevent damage to my home." "Wonderful! We could not be more pleased with our generator. It was installed in 2011 and is still working perfectly. Portman has also done several small electrical jobs for us. They are a professional company with great customer service.Portman offers a highly professional, friendly and reliable experience. We highly recommend them." NO MORE LOSS OF POWER WORRIES!.....EVER! "Would like to thank Dustin, Adam and Buck for an awesome job installing our Generac. 100% satisfied with their timeliness, efficiency, professional attitude and product. Well done boys! Michael Davis President, Michael Davis Insurance"
PASSED LOCAL INSPECTION WITH FLYING COLORS! "I purchased a Generac system from Portman Electric. I talked to two other contractors, but was most impressed by Portman and awarded them the work. The installation team did a great job! When it was time to have the job inspected by the City electrical inspector I asked the inspector what his experience was with Portman Electric jobs. I felt quite reassured when he told me that they did nice work, and that he hadn't had any problems or issues with their jobs! He also said that we were fortunate that we had Portman do the job because there are a lot of small contractors doing the work and he has seen many problems with their work. I certainly recommend Portman Electric for those considering a generator purchase. "Never have I purchased anything before with the professionalism of this company. I researched my generator purchase from many different sources BIG To small. Only Portman Electric could satisfy my questions and needs. From the function of the equipment to the installation I give them an A+. If you buy any place else you would be cheating your self." "Portman came and installed our Generator when they said they would. Honestly, they are very good and know exactly what they are doing. They came and worked in terrible winter weather in the Geauga County Snow Belt. We have no reservations in recommending Portman to anyone that reads this review. Everyone that came here from Portman was professional and personable. Chuck & Joan"
"I look for three requirements in any contractor that I deal with - Promptness, , and Overall Satisfaction based on promise. Portman Electric showed up on time to start the job, and discussed how the job would be handled. (Promptness). The installation was flawless. The power outage was less than an hour and caused absolutely no interruption. The quality of the gas and electric line installation was impressive. Lastly, every aspect of the contract was fulfilled to the letter. No surprises. (Satisfaction). I would not hesitate to recommend Portman to friends and family." HIGHLY RECOMMEND THIS GREAT DEALER! "Portman was professional in all aspects from start to finish with their salesperson, installers, and office. The quote was competitive and received in a timely fashion. The generator was installed neatly. The installers explain the work being done before and after they completed. Portman's office answered all our questions and made us comfortable with our selection. Thank you Portman!" "Best customer service we have experienced in a very long time as homeowners. Dustin was the sales rep who came out to our house for the initial consult. He was also part of the installation team along with Adam. Dustin was a pleasure to work with. He explained everything & answered all our questions. Dustin & Adam were great during the installation. They absolutely hustled. I can't remember the last time someone we hired worked so hard. They knew exactly what they were doing, worked great together, kept the house very clean & were very considerate, professional & friendly. I highly recommend Portman Electric." "Portman Electric is a great family-owned business. If you need a generator or service for one, I highly recommend them. When you call, you speak to a real person (Diane) who is super friendly and very helpful. They were able to send a licensed service rep. to my house within 48 hours. Rob was very knowledgeable and professional. He solved the problem promptly and patiently answered my many questions. I will not hesitate to contact Portman Electric for all my future needs." THE VERY BEST DEALER I'VE FOUND FOR GENERATORS. "After having a couple electricians out to try and repair my generator with no success, I just about gave up until I met to you at the Home and Garden show this year. You sounded like you knew what you were talking about. Therefore I want to say "thanks much" for finally correcting the problem on my Generic generator. It works great now. You technician was there on time and did a very professional job on the repair. I was so impressed with his knowledge of the problem. He answered all my questions and presented himself as a true gentleman. I'm sure you're glad to have him as part of your team. If I have any problems in the future Portman Electric will be the first one we'll call. It's so nice to find somebody you can trust now days." "We contacted 3 different dealers, one of them claimed to be Generac Premier dealer. We settled on Portman Electric. I am a stickler for quick response and follow-thru whenever I have a question and Dustin from Portman Electric was 'johnny on the spot'. I, not only found him to be very responsive but also very knowledgeable. Dustin and 2 others came on time and did a fantastic job with the installation. It was funny that Portman Electric was actually suggested to us by a competitor who only installed high end generators(water cooled) and this company suggested I call Portman. Competitor recommendation means a lot!!" "Dustin did an excellent job of answering all this engineer's questions, which are a lot. He answers emails and calls within a couple hours. The installation guys Adam, Dennis, John and Dustin were very skilled at their jobs. I couldn't ask more than their attention to detail. I was given a more than fair price for the additional work that was needed. It is obvious that the Portman crew has been ingrained with the concept of pleasing the customer. Well done guys!" "Their installation was very professional. Very through on install and clean up as promised. Dustin and Adam really worked to complete the install in 1 day and had us up and running. Would highly recommend this company for any electrical work. GRADE A ALL THE WAY. "Portman Electric is a joy to work with. Not only was the price right but their installation team was exceptional in every respect. In about five hours during a rain storm they made the installation without bringing any mud into my house. As a retired business man I am very impressed with the Jeff Portman team." "Portman Electric, and Dustin in particular, provided us with all the information we needed to decide on the size of generator required to keep the whole house running if the power goes out. We didn't expect to be able to do that from a budget perspective, but it was very affordable. This dealer earned my business and this recommendation because they did exactly what they said they'd do, with no extra hidden fees, charges or excuses. They are simply the best!" "The reason I went with these guys is that the Sales consultant (Dustin) was also the installer. His consultation was more reliable and realistic because he knew all angles of sales and set up. Once we were installed he took the responsibility of getting permits etc. and I did nothing (which I like). One additional comment is that I had a question here and there and I always got immediate response by email or text!" I WOULD HIGHLY RECOMMEND THIS DEALER TO ANYONE WHO WOULD LISTEN. "I contacted Portman Electric to investigate having a whole house generator placed at our residence around the middle of February. We were not in a hurry but we were very interested in having a solution in place ever since the strong winds attributed to the Hurricane last year knocked out our power for a week. My wife and I were expecting the birth of our son in March and the thought of not having power for an extended period of time with a newborn was something we were very concerned about. On my initial call, Portman promptly answered and had Dustin come out to review our needs and discuss what options were available to us within the next couple days. Dustin was very professional and did not try to oversell us on getting a unit that was more than we needed. We had done our research as we knew this would not be a cheap acquisition. We decided Dustin and Portman were the best dealer for us and within 4-5 weeks we got the Generac installed. Dustin and his counterpart were very conscientious in their work as they did not take any short cuts as they took their time to make sure the installation was done correctly but also understanding we wanted the power and gas lines to be as aesthetically pleasing as possible so as not to be an eye sore. We have not had to use our generator as of yet but it tests successfully each Monday as we were told it would and we are confident we will not have any issues. I would recommend Dustin and Portman Electric if you are looking to have a generator installed by a company who will give you complete peace of mind that you made the right decision." "The entire process - from shopping for the generator to completing the installation - was smooth. From day one, Dustin was extremely patient and helpful in answering all of our questions. Donna in the office was also very helpful as we scheduled our installation, obtained permits, etc. Finally, the installation went off without a hitch. Dustin and Mike were courteous, efficient, and neat. The job took less than a day, and it was very well done!" "Installed in one day they did a great job cleaned up the little mess they made.Very good job will have them back for yearly service call." "I would highly recommend Portman for repair or service on your home generator. After the recent hurricane, I called Portman and was very pleased with the quick response. After waiting an entire day for another company to send a technician I called Portman for help. Within 5 minutes of speaking to Portman, I was informed that they had the repair parts I needed and that a technician would be at my house within 45 minutes. The Tech arrived on time and completed the repair within an hour. Excellent considering this was during the peak of outages due to the recent weather." "We were very pleased with Portman's professionalism, technical know how and performance. Our equipment is performing as promised." DEALING WITH DUSTIN WAS GREAT. "From the start this was an exceptional experience. They promptly contacted me and made an appointment to inspect my home. They provided several written options for my consideration. They also pointed out a minor problem with my meter box which they would also fix. After speaking with other contractors and exchanging several email and phone inquiries with Dustin at Portman Electric I decided to go with them. Within a week of signing the contract a date was set and installation completed. They arrived timely and completed the installatio in a few hours.They tested the unit and reviewed the system operation with me. They cleaned up after completing the job leaving everything in good condition. I am sure I will hire them again for mny electrical needs. What I felt most comfortable about was they are licensed electricians,were an authorized dealer and they provide the service and maintenance for the generator. I highly recommend them." "Absolutely professional, knowledgable, accessible and very easy to work." "WWe had a generator for our home installed by Portman Electric. There were some challenges because we have propane but Dustin Pettrey worked with our propane company and did a wonderful job." HIGHLY RECOMMENDED. KNOWLEDGEABLE OF PRODUCT. EXCELLANT SERVICE. "Installation of Generac whole house generator system, including all wiring , running of gas line and installation of a lightning and surge arrestor.From the start this was an exceptional experience. After identifying this company they promptly contacted me and made an appointment to inspect my home. They provided several written options for my consideration. They also pointed out a minor problem with my meter box which they would also fix. After speaking with other contractors and exchanging several email and phone inquiries with Dustin at Portman Electric I decided to go with them. Within a week of signing the contract a date was set and installation completed. They arrived timely and completed the installation in a few hours. They tested the unit and reviewed the system operation with me. They cleaned up after completing the job leaving everything in good condition. I am sure I will hire them again for my electrical needs. What I felt most comfortable about was they are licensed electricians, were an authorized dealer and they provide the service and maintenace for the generator. I highly recommend them." "They were both very professional, on time, and efficient." "The 2 men were very nice and curtious and did a very good job." FANTASTIC SERVICE. EMPHASIS ON DETAIL & NEEDS. PROFESSIONAL & COURTEOUS. "I recently had a Generac CorePower installed on my 3 bedroom ranch in Chesterland Ohio. Its primary purpose was to protect the basement sump pumps against a extended power outage. These sumps are quite active and I needed to restore power to them very quickly to avoid flooding in torrential down pours. I received a post card flyer from Portman Electric in the mail and called for an estimate. I'm glad I did. My Portman Electric representative told me that with the very basic Generac unit that I needed, I could protect much more from an extended power outage. Furnace, sump pumps, well pump, freezer, refrigerator, septic aeration unit, heck even the TV and DVD player in my living room. I was very glad to hear that. I sleep much better now and I don't have to worry when I'm away from home. The unit and transfer switch panel appears to be very well built and I am glad I didn't purchase it on the internet to save a few bucks because the installation was very detailed and laborious, but Dustin at Portman Electric did a fantastic job. He even cleaned up after himself. After the install he gave me a crash course on how to test the unit, change the date and time of the run test and what circuits were now in the Generac circuit box. I am very pleased with Portman Electric and Generac (so far) and I will recommend both to any of my family and friends. For anyone that wants protection from a disruption in your electical service, a home standby generator is the ONLY way to go. Care free, runs on your homes natural gas line or LP if that is what you have. You literally don't have to do a thing. You're protected with a Generac. Oh, and btw, if you think the 3K price tag is to steep, try paying for a professional black mold cleanup in a flooded basement on your own. You'll wish you had spent the money with Generac. One more thing, for you folks that say you don't need it because you don't lose power, that may be true now, but keep in mind that the power grid your home is connected to is already 10 to 20 years out of date. With every new home and business tied to it, it only will get less stable. Extended outages may become more common. Ever lose your power on a beautiful hot humid summer day? That is a lot of air conditioners on an antiquated power grid. If you haven't,...you will. Nuff said! Call Portman Electric today. New Portman Electric Customer." "We had Portman Electric install a whole building commercial generator at our business. 1 week later, we had severe weather that knocked out power for most of the work day. We didn't have phones or internet, but we had water, lights and A/C. A few weeks later I had them install another generator at my home. Very professional and solid installation. I highly recommend Portman Electric for your Generator and electrical needs!" "When we decided that we wanted a whole house generator, we were a little puzzled as to how to make it happen. We had several companies give us estimates and information as to how things would work. We found Portman Electric to be the most informative. Dustin, who installed the Generac Generator, possessed the most knowledge about it. Perhaps it is because he attends classes given by Generac. It was so refreshing to be able to turn the whole project over to a professional. On the day of the installation, he came with the generator and everything needed to install it. When he was finished, you would have never known he was here. He left the premises clean and free of debris. Since it was installed, we have lost power twice for several hours. It worked like a charm, just as they said it would. We felt, and continue to feel, that we made the right decision by going with Portman Electric. D&ML"
"hey were both very professional, on time, and efficient."